So the present study was an attempt to clinically and radiographically evaluate the success rates of IPT using calcium hydroxide and MTA pulpotomy for managing deep dentinal caries with reversible pulpitis in primary second molars. No clinical signs of gingival swelling or sinus tract opening. No radiolucency in periapical or inter-radicular area. Class I cavities involving only the occlusal surface were selected. Children between the ages of 6-10 yrs were chosen for the study. In Group 1 following administration of local anesthesia and rubber dam isolation [Figure 1]a Indirect pulp capping with dycal [Figure 1]b, followed by zinc oxide eugenol (ZOE) cement base and restoration with miracle mix was done [Figure 1]c.
In Group 2 after the administration of local anesthesia and rubber dam isolation [Figure 2]a standard pulpotomy procedure was followed, and the pulp stumps were covered with mineral trioxide aggregate (MTA Angelus, Londrina, PR, Brazil) [Figure 2]b. Then zinc oxide eugenol cement base was placed and restored with miracle mix cement followed by placement of stainless steel crown (SSC) [Figure 2]c.
The entire procedure in both the groups was completed in the same visit. The study groups were recalled after 6 weeks, 3months, and 6 months for clinical and radiographic evaluation [Figure 3] and [Figure 4]. Radiographic evaluation was done with intraoral periapical X-rays taken at regular intervals and following were noted. Widening of periodontal ligament (PDL). Analysis of the data was accomplished by using Wilcoxan matched paired test. All 40 teeth treated with IPT were free of any clinical or radiographic symptoms or sign. Out of the 40 teeth treated with MTA pulpotomy, there was only one radiographic failure of internal resorption seen at 3 months follow-up. Rest of the teeth were free of any clinical symptoms. Statistical analysis of the data revealed 100% results with both groups since one failure was statistically insignificant. Management of the grossly decayed primary molar is common and also challenging to the pediatric dentist. A successful outcome to pulp therapy depends on accurate diagnosis of the status of the pulp prior to therapy. And this should include history, clinical, and radiographic diagnostic data aimed at determining the vitality of the pulp. If it is determined to be vital or reversibly inflamed, the vital pulp therapy techniques of IPT or pulpotomy are indicated. In our study, teeth treated with IPT were lined by Ca (OH) 2 and then based by a ZOE, followed by miracle mix restoration. Considering the life-span of the teeth treated with IPT, which would be a maximum of 4 years and the cases selected were restricted to class I (occlusal lesions), they were restored with miracle mix. All 40 teeth were free of any clinical or radiographic sign or symptom [Table 1] and [Table 2]. Few clinical studies exist evaluating MTA in primary tooth pulpotomies. The long-term evaluation of MTA used as a primary molar medicament in pulpotomies reported a 97% success rate. MTA has no toxic side effects - systematic or local. MTA is a material with proven therapeutic properties in different endodontic procedures of primary teeth already. In our study, teeth treated with MTA pulpotomy were free of any clinical pathology [Table 3] and [Table 4] except for one radiographic failure of internal resorption (97.85%) with MTA pulpotomy seen at 3-months follow-up [Figure 5], which was not statistically significant. The reasons for internal resorption could be ZOE cement which was used as a base or due to undiagnosed chronic inflammation existing in the radicular pulp prior to pulpotomy. Previous investigations of ZOE as a pulpotomy agent or as a base for pulpotomies suggest that ZOE can cause pulp inflammation, with a risk for subsequent internal resorption. 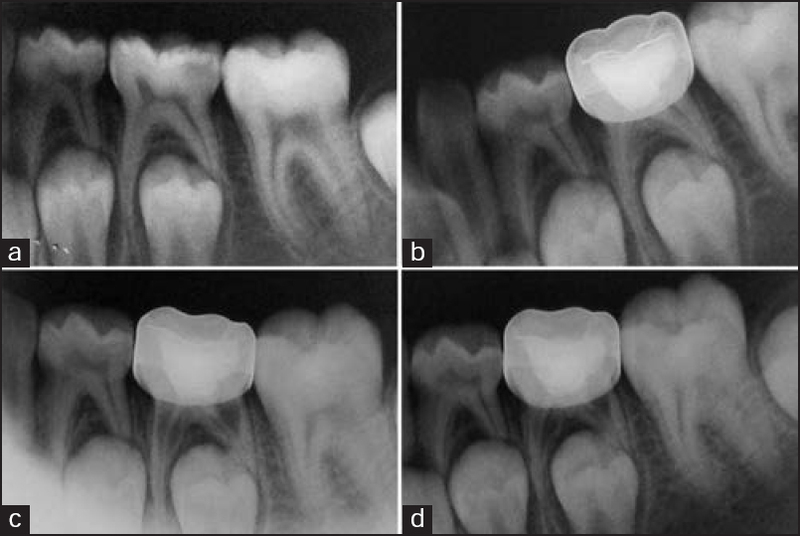 Smith et al., 2000 claimed that internal resorption is associated with eugenol. When used together with zinc oxide (as in a sub-base following pulpotomy), eugenol comes into direct contact with the vital tissue and causes a moderate to severe inflammatory response, resulting in chronic inflammation and necrosis. Cotes et al., 1997 claimed that, in pulpotomized rat teeth, if the pulp tissue is fixed by FC it will not be affected by eugenol. This, however, cannot explain the internal resorption observed in the present study. Though ZOE was used to fill the pulp chamber prior to coronal restoration, it has been placed over the MTA layer and not directly over the pulp stumps. 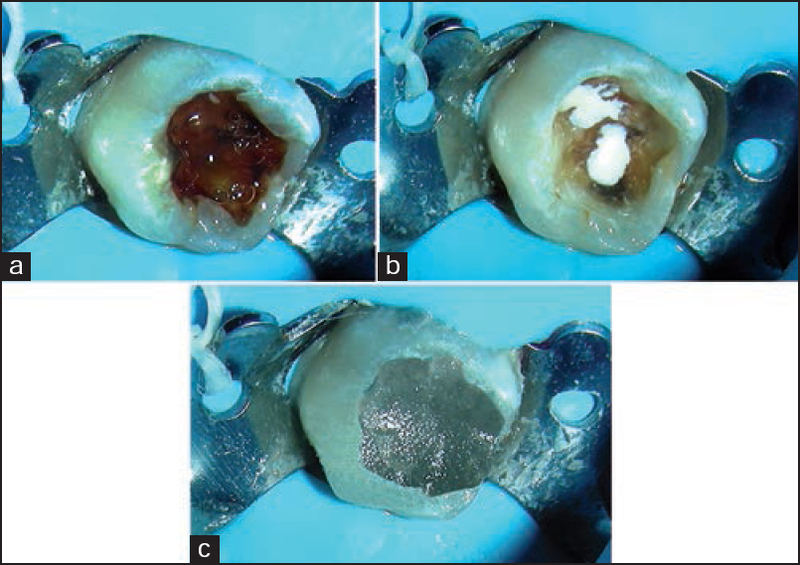 Because MTA is an excellent sealer, it is more likely that internal resorption was the result of undiagnosed chronic inflammation existing in the radicular pulp prior to pulpotomy than the result of exposure of the radicular pulp to eugenol. Internal resorption, as an obvious pathologic process, cannot be considered a sign of pulpotomy success as suggested by Smith et al., 2000. Conversely, it is not necessarily an indication of failure, as shown by Holan et al., 2005 because the aim of pulpotomy he said, is to retain a symptom-free, functional primary tooth until it reaches the age of its physiologic exfoliation. The guidelines of American Academy of Pediatric Dentistry (AAPD) 2006, states that the objective of a pulpotomy is to keep the remaining pulp healthy without adverse clinical signs or symptoms or radiographic evidence of internal or external root resorption. So in the present study, we considered internal resorption as a sign of failure. Indications for both IPT and pulpotomy are the same. Hence, why not opt for lesser invasive procedure. IPT offers several advantages over pulpotomy, fewer potential side effects, conservative procedure, non-invasive, decreased chair time, and cost-effectiveness. A careful diagnosis plus appropriate removal of the caries from the lateral walls, therefore, leaving deep carious dentin to avoid a microscopic exposure, achieves a high success with IPT for primary molars. Limitation of this study was the short evaluation period. Further long-term studies are needed to evaluate the success rates for the procedures. Coll JA. 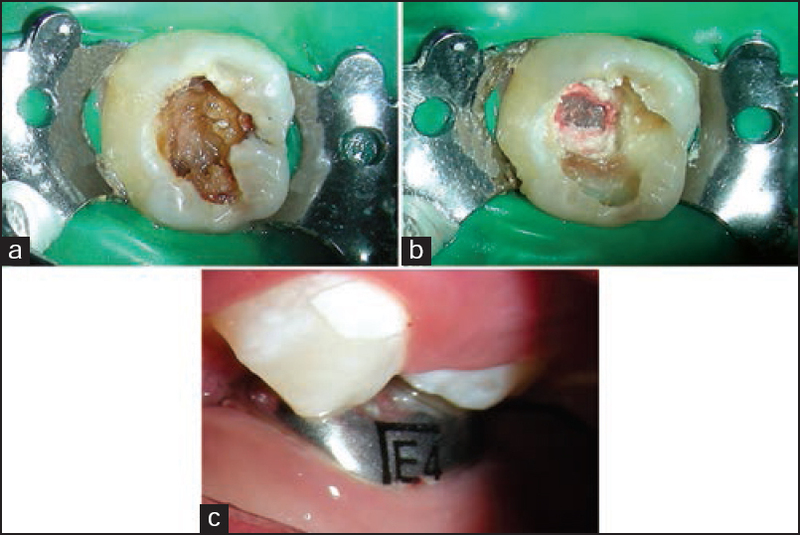 Indirect pulp capping and primary teeth: Is the primary tooth pulpotomy out of date? Pediatr Dent 2008;30:230-6. Al-Zayer MA, Straffon LH, Feigal RJ, Welch KB. Indirect pulp treatment of primary posterior teeth: A retrospective study. Pediatr Dent 2003;25:29-36. Falster CA, Araujo FB, Straffon LH, Nor JE. Indirect pulp treatment: In vivo outcomes of an adhesive resin system vs calcium hydroxide for protection of the dentin-pulp complex. Pediatr Dent 2002;24:241-8. Vij R, Coll JA, Shelton P, Farooq NS. Caries control and other variables associated with success of primary molar vital pulp therapy. Pediatr Dent 2004;26:214-20. Aponte AJ, Hartsook JT, Crowley MC. Indirect pulp capping verified. J Dent Child 1966;33:164-6. 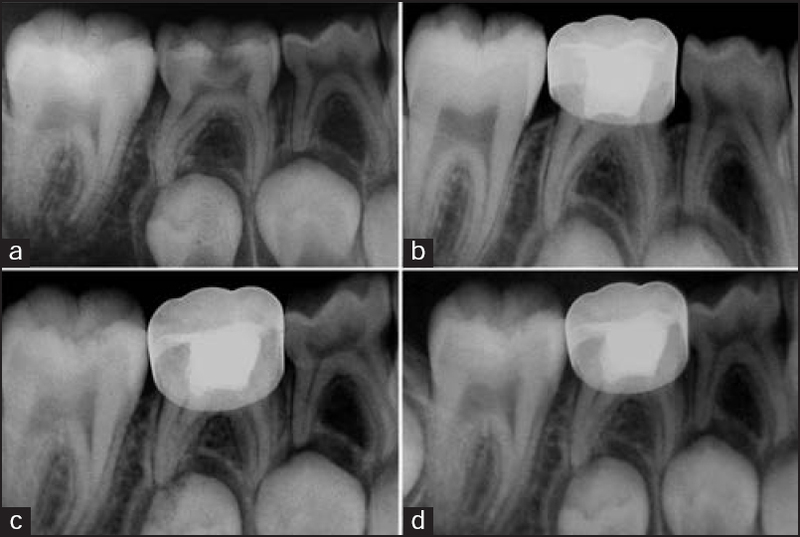 Lin L, Langeland K. Light and electron microscopic study of teeth with carious pulp exposures. Oral Surg Oral Med Oral Pathol 1981;51:292-316. Magnussun BO. Therapeutic pulpotomies in primary molars with the formocresol technique. A clinical and histological follow-up. Acta Odontol Scand 1978;36:157-65. Fuks AB, Bimstein E, Kelin H. Assessment of a 2% buffered glutaraldehyde solution in pulpotomized primary teeth of school children: A preliminary report. J Pedod 1986;10:323-30. Smith NL, Seale NS, Nunn ME. Ferric sulfate pulpotomy in primary molars: A retrospectic study. Pediatr Dent 2000;22:192-9. Casas MJ, Kenny DJ, Johnston DH, Judd PJ. 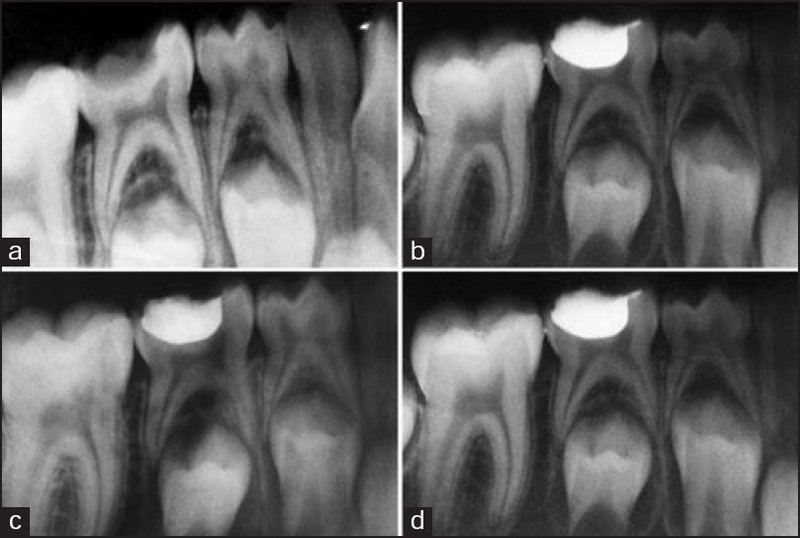 Long-term outcomes of primary molar ferric sulfate pulpotomy and root canal therapy. Pediatr Dent 2004;26:44-8. Magnusson B. Therapeutic pulpotomy in primary molars - clinical and histological follow up. I. Calcium hydroxide paste as wound dressing. Odontol Revy 1970;21:415-31. Waterhouse PJ, Nunn JH, Whitworth JM, Soames JV. Primary molar pulp therapy - histological evaluation of failure. Int J Paediatr Dent 2000;10:313-21. Zurn D, Seale NS. Light-cured calcium hydroxide vs formocresol in human primary molar pulpotomies: A randomized control trial. Pediatr Dent 2008;30:34-41. Cotes O, Boj JR, Canalda C, Carreras M. Pulpal tissue reaction to formocresol vs. ferric sulfate in pulpotomized rat teeth. J Clin Pediatr Dent 1997;21:247-53.